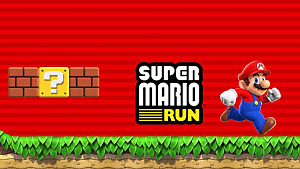 Super Mario Run has people talking, mostly because it costs $10 to unlock all six worlds after a three-level free demo. Some are saying it is a ridiculous amount to pay for the app, leading to low reviews on the iTunes store. But is the price really too steep for what the game offers? Let's take a piece-be-piece look at each feature of the app. 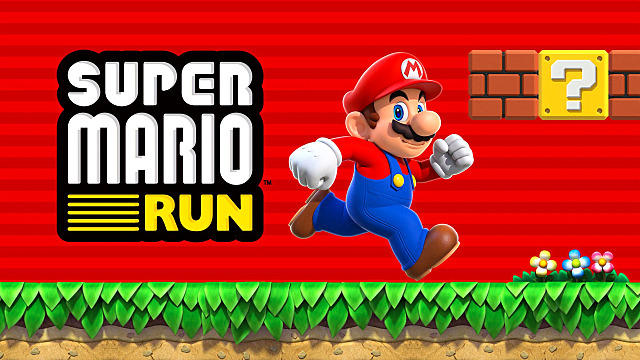 As stated before, you run and jump like in any old Mario game. 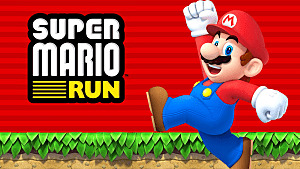 The important thing here is that Mario runs automatically. It’s up to the player to focus on jumping; in what direction, on what enemies, how high, how far. The challenge. There are no power-ups included besides the mushroom, which allows you to be hit without stopping you, and the invincibility star. The game also includes special blocks that affect how you move at certain points. Some blocks will move you backwards when jumped on, others stop you completely so you can choose a direction. It makes for interesting gameplay since you have to adjust to those blocks and figure out how they can help you. In the levels, you are able to collect regular yellow coins, time-based red coins, and special pink coins that take a bit of skill to get. 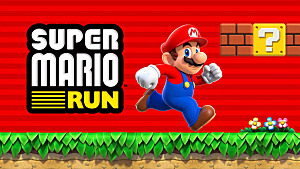 There are 24 playable levels that are noticeably shorter than usual, but the game was designed to be played in short bursts, so this choice makes sense. It’s the average story mode where you travel through all six worlds to save the princess. 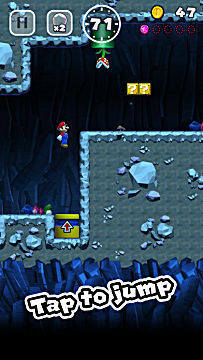 The stages feature underground levels, ghost houses, and mini-boss castles, each adding their own challenge to the game. 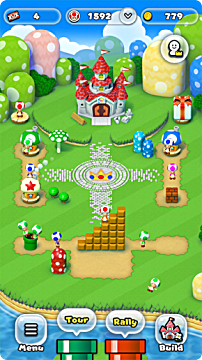 As you play the game, you will earn coins that can be used to customize your personal kingdom. You can purchase toad houses, plants, and other similar items. Doing so will give you certain bonuses like extra coins or unlockable characters who can then be used on the World Tour stages. 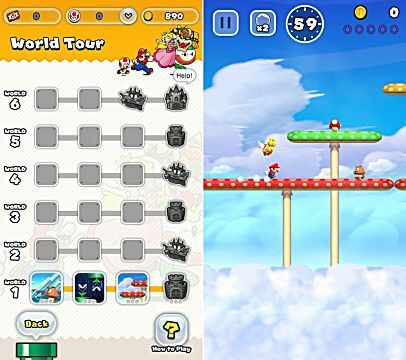 Unlocked characters have their own style of play, including Yoshi’s flutter-jump and Luigi’s long jump, adding replayability to the World Tour stages. 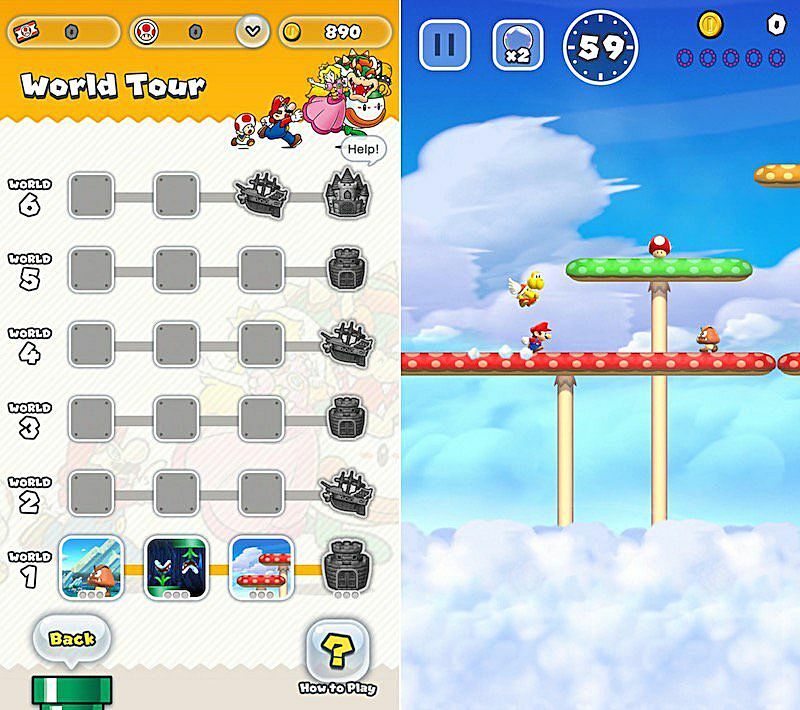 You can spend tickets earned in the World Tour or bonus stages in the kingdom to play against others in a multiplayer race. One winner is determined at the end of the round based on style jumps, coins collected, and speed. 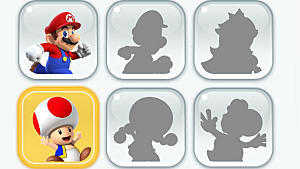 Winners get toads to populate the kingdom and earn special unlockable items. 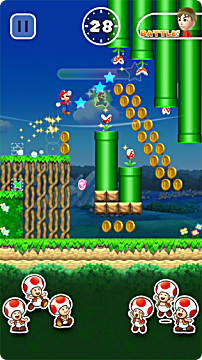 Collecting an invincibility star in this mode unlocks Coin Rush, temporarily dropping many coins you can collect. 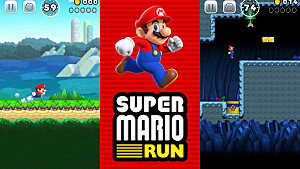 For $10, you get the Mario experience at a fraction of the cost of the regular games, and in a mobile form. 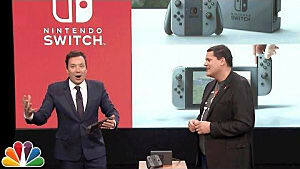 The game is great for short bursts of play throughout your day since the levels are shorter, there's a unique novelty in being able to play a Nintendo game on a non-Nintendo platform, and the competitive mode works well to challenge players on how to win over that Toad crowd. 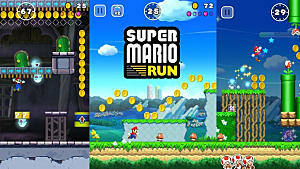 Whether or not you like this format is another question entirely, but despite that, the app offers enough in buyable items, select bonuses, and multiplayer competitions to justify its price and keep a lot of people interested. 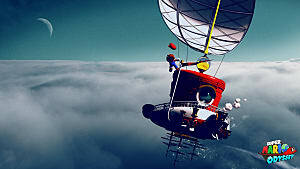 If you are a fan of the franchise, the one-time fee is worth the cost for a different take on the classic platformer. What do you guys think? Is the game worth $10 to you or was there something missing? Be sure to let us know!